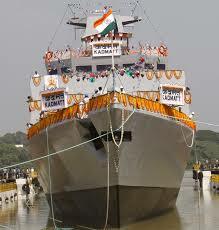 INS Kadmatt (P29) is the second of four anti-submarine warfare corvettes built for the Indian Navy by the Garden Reach Shipbuilders and Engineers of Kolkata under Project 28. She was inducted into the Eastern Naval Command of Indian Navy. INS Kadmatt has been named after the Kadmat Island of India's Lakshadweep Islands and carries on the legacy of her predecessor INS Kadmatt (P 78), which served the Navy for 24 years from 23 December 1968 to 30 November 1992. The ship was launched on 25 October 2011 by Mamatha Pallam Raju, the wife of the then Minister of State for Defence M M Pallam Raju. The ship was delivered to the Indian Navy on 26 November 2015 and was commissioned on 7 January 2016 by Chief of the Naval Staff Admiral R K Dhowan at naval dockyard in Vishakapatnam. The primary role of the INS Kadmatt is in anti submarine warfare – to protect ships in convoys and ports from enemy submarine attacks. About 90 per cent of the ship is indigenous and has been designed by the Navy's in-house organization, the Directorate of Naval Design and has been constructed using high grade steel (DMR 249A) produced in India. It produces low levels of radiated underwater noise which reduces its chances of detection. It is equipped with a host of features including anti-aircraft guns, torpedoes and rocket launchers. The ship also has on-board early warning, navigation and fire control radars besides underwater sensors and integrated communication and electronic warfare systems. The ASW-focused combat system includes four heavyweight torpedo tube launchers and a pair of 12-barreled RBU6000 rocket depth-charge launchers featuring several design improvements incorporated by Larsen & Toubro. It is not known if the locally developed Mareech anti-torpedo decoy system has been installed. The fire-control system is the Bharat Electronics IAC Mod C system. While the ships are fitted with a Humsa-NG bow-mounted sonar, an Atlas Elektronik towed array sonar set will be fitted in due course. The ship will also to be fitted with vertical launch surface-to-air missiles. Kadmatt has a low radio, acoustic, magnetic and Infra Red(IR) signature owing to a 'X' shaped hull form, raft mounted engines and an IR suppression system. The IR suppression system reduces the heat emitted by the ship reducing the infrared signature thereby defending the ship from heat seeking missiles. It will be capable of operating under nuclear, biological and chemical war theaters, acting as a highly sophisticated front line warship of the Indian Navy.